and Subordinate courts of Himachal Pradesh State. Eligible candidates can submit their application form online using the official website of HP High Court on or before 21-12-2018. Clerk Class III vacancies are 31, and Junior Office Assistant IT 2 Vacancies are Contractual Vacancies. Selection for these vacancies will be held based Screening Test, Mains Test, Typing test and Personal Interview. For more details regarding Proof Readers and Junior Office Assistant Jobs of High Court HP exam pattern, Syllabus exam dates follow the below given details. There are total 33 vacancies available in this current recruitment of HP High Court. As on 01-01-2018 age limits are 18 to 45 years and age relaxations are applicable as per HP State Govt rules. For Junior Office Assistant Any computers degree or B.E/Btech Computer Science/IT or Diploma in IT or MCA or BCA or DCA or DOEACC CCC O or A level certificate. For Clerk Class III - Bachelors degree from a recognized University and candidates must have the basic skills of Computer Usage and must have qualified the Typing Test with the speed of 30 wpm in English on Computer. Candidates can pay the amount through E Payment using debit or credit card or net banking. Or candidates can generate the SBI E chalan before closing the online application form and pay the fee in any SBI branch. Selection for these vacancies will be held based on 3 three different stages. Eligible candidates have to submit the application form online through the official website of HP High Court. Last date to apply online is 21-12-2018. 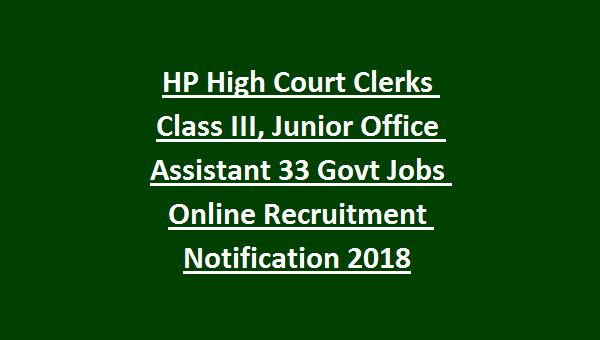 Download the official notification for Clerk Class III, Junior Office Assistant IT Jobs in HC of HP. 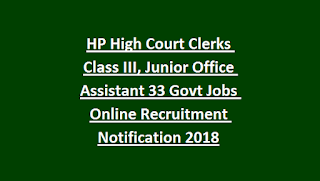 Apply Online here for HP High Court Junior Office Assistant, Clerks Govt Jobs.